Bonhomme is the mascot of Carnaval, an annual Montreal festival. Here’s a fun, blow-by-blog journal from FTF’s train reporter on riding the rails to sample Winterlude, the cold Ottawa, Ontario festival, and Carnaval de Quebec, Quebec City’s very cold festival. Both winter festivals are held annually in Canada (Winterlude the first two weeks of February and Carnaval the last three weekends in February) and are great fun for families. Winter brings some inconvenience to most of us, and today was one of those days. After waking up at 4:30am, it was a long day to get up to Ottawa, Canada where I am now writing to all of you from the comfort of the Fairmont Chateau Laurier hotel. My plane ride was changed from a one hour and small change trip to a journey of four hours and 15 minutes. Two airports, two de-icings and three coffees later, I arrived at the brand new Ottawa International Airport Terminal, drenched in northern latitude light and snowfall – a most fitting entry to the capital city of Canada. I am here to attend Winterlude, a festival staged by the National Capital Commission. Many years ago, in high school, an English teacher described Canada as “The United States with manners.” So true then, and so true now. A quick transfer from the airport to the hotel was by way of the ByWard Market, a revitalized part of downtown Ottawa. There we were able to attend the ByWard Market Stew Cook-off. Simple: just take 24 different restaurants, each with its own preparations (of bison, beef, pork, chicken, fish and venison) and give each attendee a small bowl and a spoon to sample with. Each table had wonderful variations for judging both by professionals and by cook-off attendees. It was cold, but fun, and indicative of how enjoyable Winterlude may prove to be. This afternoon, dressed for the cold, I walked past Parliament Hill, the Legislative seat of the Canadian Government. In the snowy afternoon, the stately majesty of its buildings made for an urban landscape unmatched anywhere. Then, it was off to Sparks Street, the home of a pedestrian mall filled with interesting stores and a wealth of restaurants. A travelers’ day is not complete without doing something unusual. By 4pm it was time for tea, which was served at Zoe’s Lounge at the Laurier. A host of teas, served with assorted finger sandwiches, scones with Devonshire cream and jelly, and delicious small pastries were certain to tide me over until dinnertime. It is most civilized here in this city of over 800,000 people! After a short rest in my room, it was off to the opening ceremonies of Winterlude held in the ByWard Market Area. Dancers, large puppet-like figures, speeches and fireworks combined to make the family-friendly festival warm our hearts, minds and toes, in the relative (20ºF) cold. Somehow, all the frustrations of daily life can melt away in the calm and personal warmth of a place like Ottawa, which hasn’t lost its charm in the 21st century world – may it always be like that. It’s past midnight and time for me to go. More adventures to share tomorrow. Stay Tuned! A hearty day two’s good evening to you. Right now in Ottawa, it is clear, cold (5ºF) and just a little windy. It feels good to be back in my warm room at the Fairmont Chateau Laurier and although it is very late, there’s a lot to report. After a plentiful breakfast to fortify us, our group went to Dow Lake, about 4 miles from downtown Ottawa. At this time of year, the lake is part of a 5 mile skateway that one can take in either direction, along with up to 50,000 people in the course of a day. This causeway of solid ice is open to all, at no charge whatsoever. Some very hearty Ottawans even commute by skating downtown, and babies in jogging carriages or seniors of retirement age can be seen zipping along, unencumbered by any kind of vehicular traffic, although there are traffic lights on the skateway. And if hunger overtakes you, there are places to consume much-needed hot chocolate, coffee, tea, and a local delicacy called Beaver Tails, similar to the Elephant Ears of Carnival note, or the French bakery’s palmiers. An army may travel on its stomach, but a skater travels on his or her unerring instinct for hot liquids! By the way, the Skateway travels past great little neighborhoods of well-maintained older houses, typical of this great city, as well as brand new-condos. For those of us who do not skate, Dow Lake has a few other surprises. Among them is a horse-drawn sleigh whose two well-groomed horses and driver take up to five passengers on a circuit along an ice path, at a fair pace. Out on the ice, in the cold air with wind rushing by, you have a sense that winter, although harsh in these latitudes, can still be a good thing. Close to downtown, Centennial Park had an ice sculpture display, with juried judging to follow. Many interesting shapes and variations were to be seen, including a Tyrannosaurus with quite an array of teeth. With the aid of buzz saws, we watched many of the artisans put the finishing touches on their works. After a downtown Ottawa lunch, another surprise awaited. A few times a year, Rideau Hall, the residence of the Governor General of Canada, the Right Honorable Adrienne Clarkson, is open to the public for viewing. Today, the Winterlude Festival included the residence and grounds as part of the schedule. The grounds are normally open to the public; but today there were ski races, ice skating, horse-drawn carriages (on snow this time), a recital of Inuit music performed by Inuit High School students, and tromping through the snow. As we came upon the ski races, who would be there in front of us, but the Governor General, who was chatting with people with no huge security phalanx, just a few plainclothes officers, and Canadian mounties in regular uniforms to protect her. As the Queen’s representative, she has many duties, one of which is Canadian Commander in Chief! The residence was fascinating. Many works of art were on display in the various rooms, and pictures of previous Governors General adorned the walls. To be so up close and personal in the second ranking head of state’s home was informative and very special. And, yes, there was a lot of heat for the cold winter’s afternoon. Well, tomorrow will be a day to visit a park with snow slides, toboggans, and many other surprises. Time now to rest up, get warm, and prepare for another day of interest and excitement. Our third day has been filled with fun, knowledge, travel and food. First, let me explain where this is coming from. At this moment (6:25pm) I am aboard VIA Rail Train Number 34 as it is making its way from Montréal’s eastern suburbs en route to Québec City, but more about my travels later. A lot went on during the cold, sun-filled day in Ottawa, our last in the wonderful home of Winterlude. The pattern fit every other day of my life. I awoke, made myself ready for the rigors of another morning and had breakfast, albeit heartier than usual for fortification against the cold weather. Ottawa says that they are the only city in the world that wants cold weather – after all, Winterlude wouldn’t be an event at 60°. “Cold is the norm, cold it was, and cold it will be” is my mantra for this trip. But then, as they say, things got interesting. I found myself at 9:30am awaiting my journalist companions for a dogsled ride. It takes a lot of wrangling to make sure the team is in position to take people for a rather unique form of rapid transit. The venue for this travel was nearby Gatineau Park, less than a mile from Parliament Hill and located in Québec Province, across the Ottawa River from Ottawa, Ontario, making it our first inter-provincial trip. The Park was host to many other activities including horse-drawn wagons, tubing, ice slides, children’s entertainment, and many other diverse cold weather activities. Most everything was open to everyone, and it was free – maybe we Americans should learn from the Winterlude organizers. As our hands were getting colder, the obligatory hot chocolate appeared inside a heated tent. We were all very happy for that. In order to fill the rest of our short time left in Ottawa, we headed to The Museum of Civilization, one of the best in North America. This museum is a repository of Canadian culture and has a collection of world-class exhibits from a very proud and historic nation. But, more importantly to families, it has a wonderful Children’s Museum, an interactive mini-museum of artifacts that children can play with, learn from, and develop into ideas that will make them solid citizens of the world, no matter the nationality. Unlike many other children’s museums, the focus of these exhibits was how people live in other lands. As we entered, a 3-year-old was “driving” a full-size Pakistani bus, decorated with colorful paint and lettering. His parents, hoping they were not going to careen over any curves into a boulder-strewn valley gripped the back of the seat apprehensively but, fortunately, all turned out okay. Among other exhibits was a Pyramid that housed an exhibit about ancient Egypt, a Netherlands House that featured building components and their relation to houses, and an Indonesian dwelling that contained shadow puppets and a gamelan (an Indonesian instrument not unlike a xylophone). The exhibits continued, more than enough to engage any child between the ages of 3 and 10, and there were many attending today. My favorite was an exhibit for children about how to pack – which then led into how to prepare for traveling. Soon our whirlwind tour of the museum came to an end, and off we went for lunch, followed by our exciting train ride out of Ottawa. We are now traveling to our next destination, Québec City, by train, or, rather, two trains. For the first stage of our journey, we boarded in Ottawa for a two-hour ride through rural and suburban Canada, racing past large snow-covered fields, small towns, and hockey games being played outdoors almost everywhere. In what seemed like minutes, we arrived at Central Station in Montréal, where we boarded another train to our final destination. Now, on a late afternoon departure from Montréal to Québec City, this train is comprised of brand new rolling stock called Renaissance. All cars feature a civilized two and one seating arrangement, along with a 110V A.C. outlet at each seat for laptops like the one I am using now. Quiet, bright and smooth-riding, they are the hallmark of future travel by train. On the extra fare VIA1 Class A, a delicious, hot, three-course meal, along with the beverage of your choice is served at your seat. Eminently civilized! Soon, we will be in Québec City, with many things to do during Carnival, the pre-Lenten festival that is celebrating its 50th anniversary. I need to get my things together (and my overcoat) for the arrival. More to come tomorrow! There is an old saying that things could not possibly get better. Well, on this trip they are. It is a picture-perfect snowy night in Old Québec, and from my room on the 10th floor of the Fairmont Le Chateau Frontenac hotel, I am watching the St. Lawrence flow downriver towards the Atlantic Ocean many hundreds of miles away. The twinkling lights all around add to the drama of what is, inarguably, North America’s most European City. But what about the day? Once again, I am exhausted from the rigors of a day filled with activities performed and observed in this wonderful historic city. After breakfast, it was decided that we would ride the ferry from the foot of Old Québec to Levis, a 10-minute, 5/8-mile ride across the St. Lawrence River. Noting the ice flowing east, it was a wonder how anyone would be bold enough to schedule a ferry-ride during this kind of river-borne treachery. The two ferries in use are icebreakers, and our round trip went effortlessly. It was an hour well spent in observation of the river and the land. To get to our ferry and back, we used a rather unique form of transportation: Funiculaire du Vieux-Quebéc. The funiculaire is basically a glassed-in elevator on tracks which proceeds down an incline. The ride takes about 2½ minutes, not too long, but the view of the Old Port is breathtaking in each direction. Yes, you could walk down steps, but with all the snow and ice, the funiculaire is the safest way to travel. Continuing on the transport mode, when we returned back to the hotel, we took a toboggan ride down a short, fast track. We probably went no faster than a car on a two-lane highway with some traffic, but, personally, I felt that we were going to surpass Captain Chuck Yeager as he broke the sound barrier! All was perfectly safe, and we arrived in style with no concussions or bruises to mark our quick passage. After lunch, it was on to Place Desjardins on the Plains of Abraham, a part of Carnival. Many hands-on rides and activities for all ages were set up and, of course, this intrepid reporter tried his personal best on some of them. Two thumbs up was the verdict on what was titled the “Kraft Dinner Snow Rafting.” Basically it consisted of white-water rafts, filled with eight adults, pushed down a slide of about 250 feet. Oh, I forgot to tell you the raft was completely circular, and not only went fast, but spun around 360º a few times in the process!! For a few minutes after, my senses had whirling-dervish-in-a-blender syndrome. Now I can empathize with DVD’s! The best activity there was also the most unusual: take a pair of big skis, eight tires within two bulldozer treads, one automotive engine, a gearbox, steering wheel and drive-train, then enclose them in a plywood-covered, 1950’s era shell with seats for eight, and you will have an idea of what took us for a ride. Modern versions of these snowmobiles exist today, but this mid-20th century conveyance secured a place in my Transport Hall of Fame’s Top 10. After all this travel, my own feet propelled me towards the wonderful snow sculptures on display at the foot of Place Desjardins. Imagination had no boundaries with whales, giant hands, birds, abstracts and many other objects placed on display. At least, they weren’t moving! The afternoon was topped off with one of the more unique aspects of Carnival, Bonhomme’s Luxurious Palace. 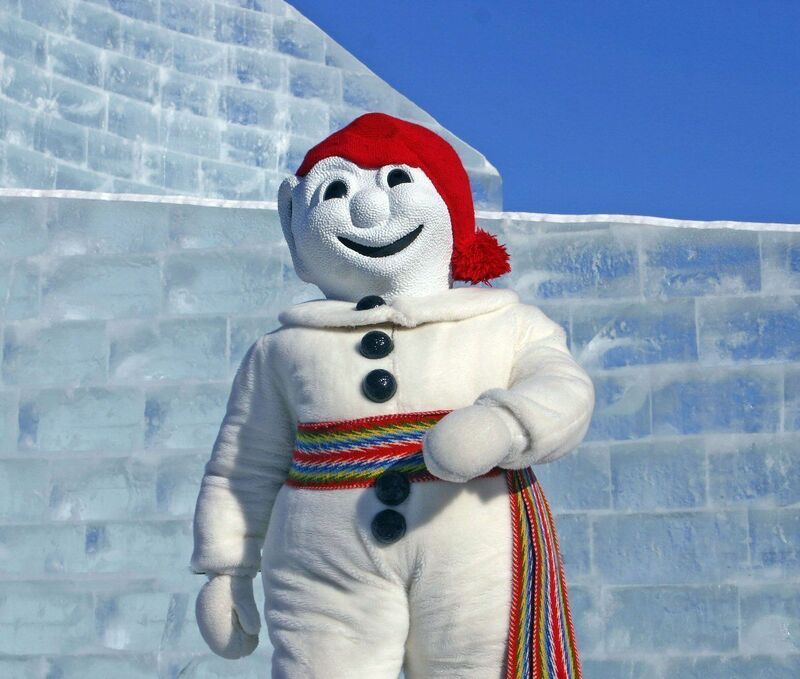 Bonhomme is the cultural icon for the pre-Lenten fest, and he really exists. We met him at breakfast this morning and he taught us to say “Joyeux Carnival” (Have a Great Carnival!). His real estate holdings are temporary and lack a roof as they are made of blocks of ice. Needless to say, heating is a problem, but he will take it in stride, like all of us should. Well, that makes a ferry, a toboggan, an incline, a snow raft, a snowmobile, a cultural icon and his real estate, all in one magic day. It’s almost midnight, and I will have to get up very soon to visit The Ice Hotel, built in the same method as Bonhomme’s home. More to follow, tomorrow, same time, same station. Today’s report will be somewhat shorter than what you have seen in the past few days: transport of all kinds was at a disappointing minimum. I cannot report about traveling by yak, scooter, or any other diverse means of going from one place to another, it just didn’t happen. Today was a tale of two hotels, one old and one new, in two different areas: The Ice Hotel located about 30 minutes from downtown Québec, and the Fairmont Le Chateau Frontenac, at the heart of the city. Major difference between the two? The Frontenac has heat. Yes, the Ice Hotel lives up to its name by being made of 400 tons of ice and 12,000 tons of snow. Its 19 rooms and 19 suites have no heat and no doors. The bedding is a little less than heavenly, consisting of a large ice block with a plywood board, covered by fabric and sleeping bags. While there are sanitary facilities with hot and cold running water in sinks, a shower is out of the question until you leave your room for the day. Oh, and don’t plan on sleeping late. Public tours start at 10am, in time to see the Chapel, Absolut Bar, Disco (! ), and the rooms themselves. Don’t worry about a room with a view; there are no windows. Between hotels, we were given a tour of Québec City by a wonderful woman, Nicole Bergeron. A 30-year resident, and probably the best club van driver I have ridden with, Ms. Bergeron gave a most fascinating tour of the new and old parts of the city with its many museums, residential areas, parks, and streets. We took a walking tour of the Old Port, which includes a street said to be the oldest in North America, but certainly not the widest. There was much more to see, and the next time I would love to use her guide service again. But the Frontenac beckoned. There are so many people that wish to see the castle-like structure, that public tours of the hotel are given all year round. There are many parts of the hotel, not all original as built in 1893, according to our tour guide who brought its history to life by taking us to visit some rooms in the hotel. He explained how Churchill, Roosevelt and Mackenzie King planned D-Day there in 1943 during a three-week stay. Many other Presidents have enjoyed the splendor of staying in a true urban resort. Not a Head of State? Not a problem, the staff will try and treat you like one. 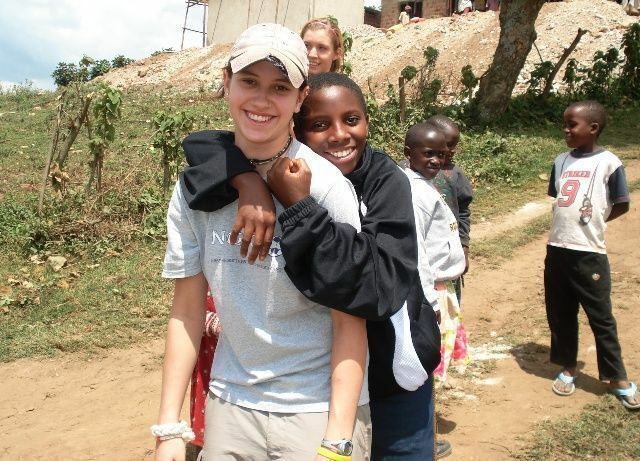 This is one of the best places I have been to, and cannot wait to come back soon. Tomorrow, a rapid, daylight ride on VIA Rail will take us back to Montréal for a brief flight home to New York City. I thank all of you for following my travels.